Are you ready for more posture help? Once you have mastered Pelvic Tilts and you know how to hold neutral pelvis, you are ready to learn how to use core stabilization in your every day life. Your core is made up of your spine and back muscles, your abdominal muscles, your pelvic floor muscles, and your diaphragm. The following exercises help to strengthen your ability to hold neutral pelvis. Let's start with lunges, since these can be easily converted into daily activities. This is best performed in front of a mirror. First find neutral pelvis by tilting your pelvis back and forth a few times, and locking gently in place. Once it is locked, your back should stay steady and not bend or arch. Step back and repeat on the other side. Once you have mastered holding neutral pelvis during these motions, try lunging a little further, to the back, sides, and diagonally. Can you do all these movements without losing neutral pelvis? Great work! Try having someone observe you as well. The final challenge, which is where it becomes useful, is to incorporate it into your life. Try lunging to push the vacuum cleaner! The next best posture help core stability exercise is squats. Again, you need to be able to hold neutral pelvis to be able to perform these. This is best performed the first several times in front of a mirror. First stand with your feet shoulder width apart, or even wider. Find neutral pelvis in a standing position by tilting your pelvis back and forth a few times, and locking gently in place. Once it is locked, your back should stay steady and not bend or arch. Bend your knees gently to no more than 90 degrees, and return to standing. Maintain neutral pelvis, meaning don't bend or straighten your back, don't dip one hip lower than the other, and don't twist at the waist. Try to reach further down by bending at your hip joint, not at your waist. See how far down you can reach. This exercise will help you to lift safely and spare your back from injury. The combination of lunges and squats helps with most of our standing activities through the day. They help us to use our strong leg muscles to do the work for us, instead of the much smaller back muscles which are just intended to stabilize and fine tune our back motions, not do the heavy lifting. Now try a squat with a partial lunge. Step forward on the right one step. Squat in this position. Now repeat with your legs in different stances. These lunges translate into real world applications of bending and lifting items. Now place a light box on a low surface like a coffee table. Do a lunge to lift it without bending your back. How did that feel? If you are able, try lifting from a lower surface but remember, bend at your hips, not at your back! So how do you incorporate the above exercises into your daily life? They are useful for most standing activities. 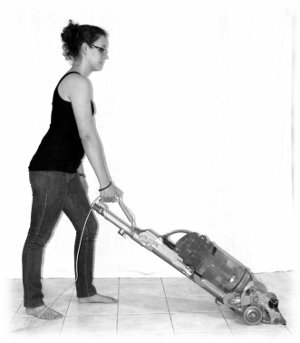 Vacuuming is really a repeated forward lunge (see image above). Lifting is a lunge/squat as discussed above. 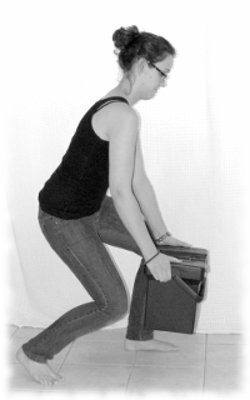 Working at a counter is best served by a sustained lunge with your knee supported on the cabinet. 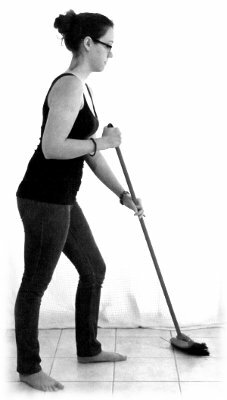 Sweeping can also be performed with various lunges. As you can see from these examples, most standing work is going to be a based on these exercises. Cashiers should try to do a slight lunge and find something to support their knee. The same is true of any standing job where you are working at a counter. Changing positions frequently is important in all work, but especially when you are standing. If you need to lift things, heavy or light, protect your back with a little planning. Even in tight space, a lift squat combo should help you use your legs for most lifts. Do you have a sitting job? Check out this discussion of Proper Sitting Posture. Return from Posture Help - Core Stabalization to Home.